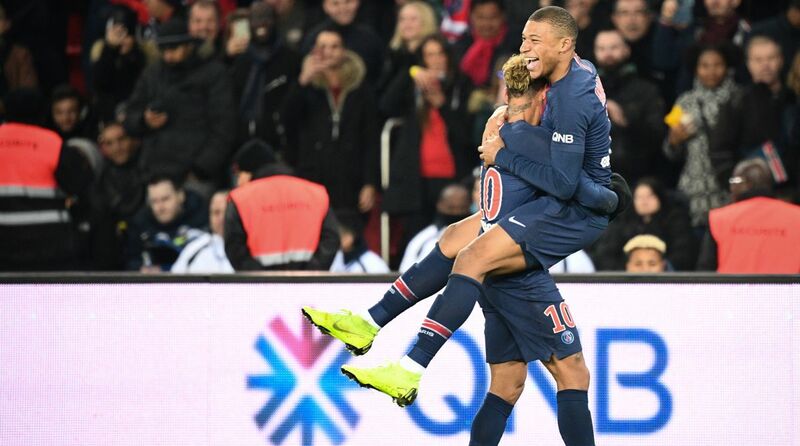 Paris Saint-Germain took a big step towards qualifying for the Champions League knockout stages after Neymar helped sink Liverpool in a blistering 2-1 win at the Parc des Princes. The Brazilian struck in the 37th minute after Juan Bernat’s early opener to put qualification for the last 16 in the French champions’ hands and leave Jurgen Klopp’s team needing to beat Napoli 1-0 or by two clear goals in two week’s time to guarantee a place in the knockout stage. Thomas Tuchel’s PSG have massive European ambitions but have flattered to deceive on the continent since being taken over by Qatari investors, and after defeats at Anfield and draws with Group C leaders Napoli Wednesday’s win gives them a great chance of qualifying from an extremely tight group. They are in second place but still need a win at Red Star Belgrade — who they beat 6-1 in Paris in October — to ensure a knockout berth as they go into the final round of fixtures just two points ahead of Liverpool. “It was our last chance to show that we are capable of competing with a team like Liverpool, a team with an incredible mentality,” said PSG coach Thomas Tuchel. Defeat left a bad taste in Klopp’s mouth, with the German coach frustrated by refereeing that he claimed made his side look like “butchers” while only booking Marco Verratti for a high first-half tackle on Joe Gomez. Napoli meanwhile are just a point ahead of PSG but three ahead of Liverpool after breezing past Red Star Belgrade 3-1 thanks to Marek Hamsik’s first goal of the season and a Dries Mertens double. Carlo Ancelotti’s side know that having beaten the Premier League outfit 1-0 in October a goal at Anfield next month would make their task much easier. If they score the Reds would need to do so three times without reply to qualify ahead of the Italians with a superior head-to-head record. A draw would also see them go through. Harry Kane said Tottenham Hotspur will go “all guns blazing” at Barcelona in two weeks time after Christian Eriksen brought his side back from the dead with the late winner in a pulsating clash with Inter Milan at Wembley. Mauricio Pocchetino’s side go level on seven points with Inter but move above them into second in Group B thanks to their head-to-head away goals and now need to match Inter’s result in the final week to qualify. They will travel to the Camp Nou on December 11 to take on Barcelona, who showed no signs of slowing down in a 2-1 win at PSV Eindhoven which guaranteed top spot. “We played out from the back, through the lines, and we could have got a couple in the first half. The clean sheet was massive and thankfully we got the goal,” said Kane to BT Sport. Atletico Madrid cruised into the next round with a simple 2-0 win over a Monaco team packed with youngsters and short on experience. Koke set the ball rolling against Thierry Henry’s rock-bottom Monaco after just 90 seconds, before Antoine Griezmann ended the match as a contest after just 24 minutes. Porto and Schalke qualified before their Group D match kicked off thanks to Galatasaray falling 2-0 at Lokomotiv Moscow. Goals from Eder Militao and Jesus Corona put the Portuguese champions two up early in the second half before Nabil Bentaleb’s 89th-minute penalty have the German’s hope of a late point. However Moussa Marega slotted home the third to seal first place for Sergio Conceicao’s team. Borussia Dortmund also qualified following their goalless draw with Club Brugge.